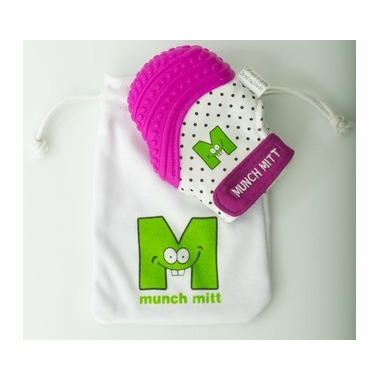 The Munch Mitt is a “handy” teething solution that prevents the constant dropping of teething toys. It provides easy access pain relief for babies who are still learning consistent grip and direction and protects the hands from irritation due to chewing. Interchangeable between hands. Flip mitt and make sure thumb area is always where baby's thumb is. my friend and I bought one for our kids and we noticed that the babies don't like wearing the glove. they rather hold it and chew. Great idea for a young one that canâ€™t quite hold a teething toy yet. Could be made a little smaller but otherwise good. Baby tries to remove it. The quality is good. Nice material but it's too big for my 6 month old. Recommend for babies with bigger hands or a little older. Love the concept but it's way to big for my five month old. It's too large to stay on her hand, and too heavy for her to get to her mouth. Going to keep trying! My 3 year old daughter loves this mitt. She is special needs and has recently discovered her hands and likes to chew on them. This mitt gives her a safer opportunity to do so, while the crinkly sound and nubbed silicone texture allows for audial/oral stimulation. Just wish it came in a bigger size. Genius! My baby girl loves it, she gets so excited when I put it on her. Literally entertains her for a good 20 minutes or more. She really loves the polka dots and stares at them as well as the crunchy type noise it makes. Great concept. My daughter was always wanting to put her hands and toys in her mouth and this helped but it was very hard for her to angle properly in her mouth so she could chew on it as the purple chew part is quite large. But other than that it's pretty good.